According to Nat Bodian, envelopes have a higher chance of being delivered to a business address when their color is one that is commonly used in business— most often, white. The most successful envelopes have no label or window, is typed or computer-addressed, and has a personalized look. An envelope with the mailer’s name and address printed as a corner card will out-pull one recognizable as advertising that does not identify the mailer. You greatly reduce the chances of getting un-deliverable mail back if you print your return address on the envelope’s back flap. The most common pattern of eye flow by the recipient of a sealed envelope is first to the recipient’s name and address, then to headline copy next to the address area, then to the corner card and return address, and last to the postage corner. 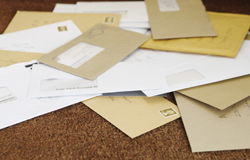 Response tends not to vary whether you use a standard-format or a custom-made envelope. A mailing in an oversized envelope is more likely to be opened and read if it has a headline on the outside. Large envelopes with a die-cut opening for the mailing address will pull better than similar envelopes carrying Cheshire addressing labels. If you use first-class postage, you will improve response by saying so in a headline. The easiest way to make a repeat mailing look new is to change the envelope size. The sole purpose of an envelope headline is to induce the recipient to open the envelope. Envelope teaser copy is usually not necessary on mailings to established customers. The ideal location for a teaser headline is the lower left-hand corner of the envelope, above the bottom line of the mailing address.